Some of our service dog applicants, like Jennifer, have experienced disappointment in their search for the right organization and the right dog to meet their needs. 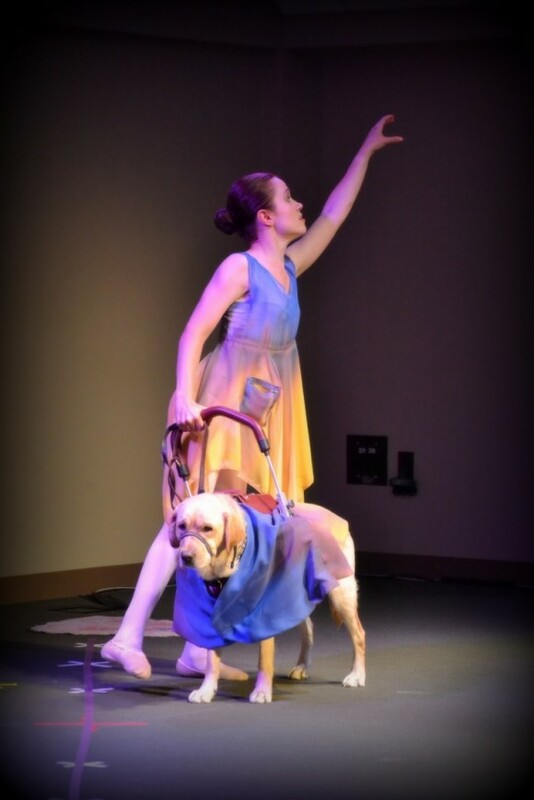 Coping with Cerebral Palsy has posed interesting challenges for Jennifer’s life and the pursuit of her passion for dance over time. Though she had never been a dog owner, her research and her heart told her a service dog could help her live more independently. Many years ago, Jennifer made the decision to submit an application to another national service dog organization. She never heard back. It wasn’t until she talked to a CPL graduate a few years ago that she found the right fit. A friend of Jennifer’s received a dog from Canine Partners for Life and introduced her to the organization. Jennifer did some more research and found that CPL was the best option for her. She applied for a service dog from CPL and was matched with a yellow Labrador named Smidget. Jennifer says her partnership with Smidget was “meant to be.” Smidget was originally matched with another applicant who had ALS. Unfortunately, that applicant passed away before their Team Training session began. Our trainers then requested Jennifer visit CPL to meet Smidget and determine if he was the right partner for her. Jennifer describes herself as a petite person and required a smaller dog. As fate would have it, Smidget was just the right fit! Jennifer fell in love with Smidget right away and believes they were made for each other. But, they had a lot of work to do before they could become a successful team. Because Smidget was originally placed with a person who did not require balance or mobility assistance, he had to learn to walk with Jennifer and to provide the support she needed. She advises service dog applicants and future graduates to, “Work hard and don’t give up. [Partnering with a service dog] takes dedication and hard work. You have to stick it out.” They experienced lots of falls during Team Training, but Jennifer and Smidget always got back up and kept going. Together, they overcame every obstacle placed in front of them and graduated from the CPL program in Summer 2013. Since bringing Smidget home, Jennifer’s confidence and independence have drastically improved. In fact, Jennifer has surprised herself with how well things are going. A huge reason for their growth as a team is because their local CPL approved trainer in North Carolina is able to help reinforce the training CPL began. Though she had a lot to learn about owning a dog, the whole family has adjusted well and Smidget is now part of the family. Jennifer and her husband are even thinking about expanding their family, and she notes, “He’s great practice for parenthood, having to care for this being that you think of as family. We even pack a doggie diaper bag when we go on vacation.” Jennifer feels comforted knowing CPL will be there for her as she experiences this considerable life change. In the meantime, the two are enjoying life. Smidget has accompanied Jennifer to the State Fair – something she hasn’t done in more than 10 years – and to Las Vegas. Their trip to Las Vegas was one of the best experiences they’ve had together. Receiving compliments on their skills and partnership was a big confidence builder for the two of them. This trip was definitely an eye-opener for Jennifer and made her realize just how far they’ve come as a team. Perhaps the most meaningful impact Smidget has made is enhancing Jennifer’s passion for dance. She teaches dance to students with special needs. Whether he is observing class or dancing with Jennifer in costume, Smidget is always incorporated into the experience. She says that his participation, “adds another dimension to what I can do, and the people I can reach in my love of dance.” Jennifer is so grateful that dance is something she does that he can be a part of. It has strengthened their bond.